Nothing quite inspires like life does. Little moments greet us with overwhelmingly inspirational vibes and to the eyes of the beholder, the conscious one, being motivated is an obvious eventuality. The Green Saviours experience has been a revelation of sorts to both the team members and myself. The experience of working with once unknown people and the little incidents that crop up along the way have left us with memories, moments and lessons for a life time. 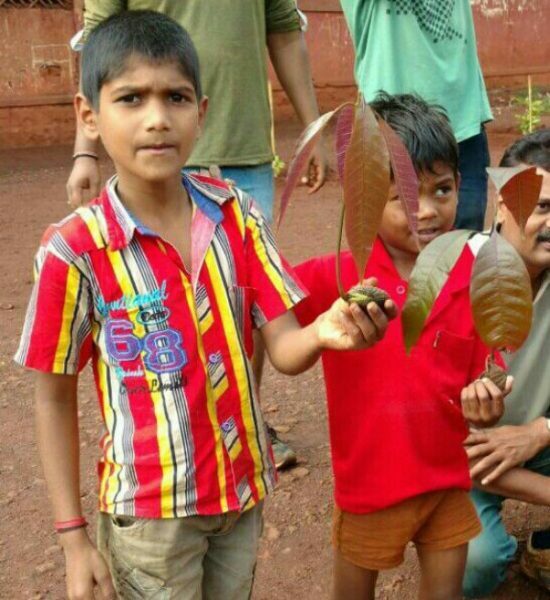 One such surprise awaited us at yesterday’s plantation drive at Tilakwadi. The Green Saviours group gathered at around 7.30 and went about their Sunday morning chores of planting trees. While they were busy wrapping up proceedings, a few of them noticed two kids from the vicinity who had come with their own saplings as if to say, we too wish to contribute. They had managed to pick up two prospective Mango plants from the road side and very proudly were displaying the same as they made their entrance. Funny thing is that they weren’t even students from the school where we were planting trees; they heard somewhere and from someone or maybe saw us doing it and volunteered to do our bit. The Green Saviours wishes to thank life itself for providing this inspirational moment. They will shortly commence what they call “Sapling Harvesting”. Quite a few of them do the morning walk and they are now using the time to scan the road sides for saplings. The idea is to keep a harvesting kit handy with sickles, a plastic bag, soil, manure and some water, in our cars so that we go out a couple of times during the week to pick up these wonderful offerings of nature. In most cases, these saplings come up in spaces that are too small or too inappropriate to accommodate them. Planting them elsewhere would be great. The Group wishes to extend a request to all Belgaumites to inform them of such saplings which are waiting to be picked up so that the Green Saviours team can, maybe, have its own nursery. Citizens could also do is the favour of dropping fruit seeds in their backyard and then asking us to pick these little plants once they crop up. Please contact us on 9611313919 and help us build our own collection. Let’s do this for the city of Belagavi…..